This article was originally published in Corrosion & Materials August 2015. Percival Faraday Thompson (P F Thompson, PFT), (1885-1951) a metallurgist and chemical analyst, is widely considered as Australia’s pioneer in corrosion science and education. Each year at the annual ACA Conference, the P F Thompson Memorial Lecture is presented by a person who has made a most significant contribution to corrosion science and engineering in Australia. While each presenter usually gives a few details of the work of PFT for the benefit of Conference attendees, the entire body of his work and details about his life are not provided due to the limitations on the lecture duration. 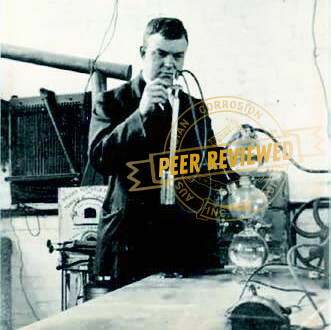 A review of Thompson’s life and some of his work is available in the ‘Australasian Corrosion Engineering’ publication which was the ACA publication in the early 70s, and is one of the precursors to the current ACA publication Corrosion & Materials (Potter, 1972). However this publication is not widely available to the ACA membership, and certainly not in electronic format. The purpose of this paper is to provide readers with some of the history of the PFT Lecture, and to acquaint readers of ‘Corrosion & Materials’ and the broader corrosion prevention community with the breadth of the scientific work of PFT and his enthusiasm for describing corrosion science through practical public demonstrations of experiments of the basic principles of corrosion. In 1906 at age 20, P F Thompson was appointed to lecture chemistry at the Melbourne Working Men’s College(now RMIT University), he published his first scientific paper in 1912. In 1918 he moved to Melbourne University. At this time, research as a university activity was still in its infancy and most academics spent much of their time on ‘scholarship’ and teaching, but PFT continued his experimentation, much of it involving electrochemistry. In 1925, he became President of the Society of Chemical Industry of Victoria and published his evidence attributing the passivity of stainless steels in certain aqueous media to a surface film of mixed oxides. In 1928 PFT was promoted to Senior Lecturer, and in 1932 was Acting Professor of Metallurgy. In the early 1940’s PFT returned to Melbourne Working Men’s College and in 1942 joined the Division of Aeronautics at the Council for Scientific and Industrial Research (CSIR), (the forerunner of the CSIRO), where he worked for the RAAF on corrosion problems related to the cooling water for Spitfire aircraft engines. Potter (1972) reports that Thompson pursued and advised upon a wide variety of corrosion and metallurgical problems with enviable success whilst at CSIR. He preferred investigation to administration, and remained a keen student-examiner and critic in the subjects he had taught at Melbourne Working Mens College and Melbourne University for over 30 years. It is interesting that the CSIR Division of Aeronautics later became the Aeronautical Research Laboratory (ARL) and then the Defence Science and Technology Organisation (DSTO). Nearly 50 years after P F Thompson’s death, the aircraft corrosion related work initiated by him at ARL in 1949 is still continuing at DSTO. It says something about his foresight, that he knew it was important to establish such a capability within the old Department of Supply. Defence aviation has clearly been the beneficiary of P F Thompson’s foresight and legacy. From an examination of P F Thompson’s published reports and papers, it is possible to appreciate the diverse range of scientific research in which he was involved at various stages of his career. Thompson was also a well-respected consultant and a highly sought after lecturer by professional groups. His publications and lecture transcripts indicate that he was not afraid of changing direction in a particular line of research and he delighted in a scientific challenge. When Thompson began to publish his work, he was primarily interested in analytical chemistry, mineral dressing and assaying, and over the years he became more interested in corrosion. In the following section the publications of Thompson are summarised, with his work on analytical chemistry briefly and his work on corrosion in more detail. The reports and papers of PFT are a delight to read. They are well written, easy to understand and show excellent use of the English language. Electronic copies of all publications are available from the authors and from the ACA. In a very informative and entertaining paper written in 1934 (Thompson, 1934a) PFT traced the development of analytical chemistry from the work of ancient alchemists in the Greek and Roman eras, to the efforts in the middle east by Persians and Arabs, the discoveries of Boyle, Priestley and Cavendish and the potentiometric techniques of Bottger in the late19th century. He strongly argued against adoption of standard methods of chemical analysis and was sceptical of the use of machines for automatic and mechanical analysis (Thompson, 1932a). His view was that “standard methods indicate a loss of that independence of thought which should be the most sacred possession of the professional man”. PFT was always keen to deliver lectures to learned society members on a range of topics, an example of which is his lecture to the Victorian branch of the Australian Chemical Institute in 1930 on “A Sense of Proportion in Analytical Chemistry” (Thompson, 1930). This lecture was about sampling techniques to ensure representative proportions of all constituents are taken from samples of ores, chemical mixtures etc., the use of significant figures and the consistency of use of scientific units in written documents. PFT also developed and published new techniques for chemical analysis (Thompson, 1926), as well as new indicator formulations for use in chemical analysis (Thompson, 1931a and 1933a). During his time at the University of Melbourne and later at CSIR, PFT developed an interest in mineral processing and assaying. These interests lead to his development of a new volumetric method for the determination of iron (Thompson, 1922), a new rapid technique for determining the levels of lead inore samples (Thompson, 1929),and a method of using potassium hydroxide as a fusion agent for use in nickel crucibles when assaying pyritic ores for sulphur and antimony (Thompson, 1932b). This method allowed lower temperatures to be used as the melting temperature of potassium hydroxide is 380°C. In 1934, Thompson reviewed the principles of flotation and ore dressing (Thompson, 1934b). He was always keen to optimise the gold winning process from ores, and in 1933 he published a paper that described the influence that telluride solubility has on that process (Thompson, 1933). Much later in his career at CSIR, he put his considerable electrochemistry knowledge to use to explain the mechanism through which gold is dissolved from cyanide solutions (Thompson, 1947) when he contributed on the subject to the General Meeting of the American Electrochemical Society in April 1947 (Potter, 1972). He was to show that the “dissolution of gold in the presence of cyanide and oxygen was “… an electrochemical process essentially similar to corrosion” (McCarthy 2001). One of the other contributors at the 1947 American Electrochemical Society meeting was U R Evans (1889-1980) of Cambridge University fame, the publisher of several corrosion science books and described in the Biographical Memoirs of Fellows of the Royal Society as the “Father of the modern science of corrosion and protection of metals”. Both Thompson and Evans had their respective papers presented by distinguished American proxies and, not leaving their home countries, the two men never met. They certainly knew each other, however (Potter, 1972). PFT developed a new high temperature furnace which could reach temperatures of 1600°C in a few minutes. The standard muffle furnace used for assaying in those days took considerable time to reach a maximum of 1200°C. The rapid rise to the higher temperatures was achieved using ash less gas carbon as a fuel in conjunction with blasts of air provided by an electric motor. This was a revolutionary approach and resulted in more rapid assaying of ores (Thompson, 1932c). In assaying, the maintenance of furnaces and refractories in particular is very important. PFT reviewed refractories and their uses in a paper delivered to the Melbourne University Metallurgical Society and published in 1931 (Thompson, 1931b). In that paper he discussed the nature and properties of refractories, the physical changes they undergo during heating and cooling, their reaction with various gases, and methods for testing their high temperature mechanical properties. In the 1930s the study of ceramic as a material was in its infancy. PFT concluded his paper by saying, “one may be sure that in time a fuller understanding, rivalling that of metals will grow out of the slough of empiricism in which the study of refractory materials has long been struggling”. P F Thompson began to publish on the topic of corrosion in 1932. Many of his publications were transcripts of his lectures to various learned societies. Thompson’s view at the time in 1932, was that the engineering community was largely ignorant about the nature and mechanisms of corrosion. To quote PFT, “Around no subject of technical interest have prejudice and wrong thinking in the past, so wrapped a web of obscurity as that of the corrosion of metals” (Thompson, 1932d). In the following section, the detailed summaries of the published corrosion work of PFT are presented in chronological order. The quotation in the previous paragraph was the opening statement of PFT’s lecture to the Australasian Institute of Mining and Metallurgy in 1932. He announced that the definition of corrosion was “the dispersion and waste of the useful solid metal by conversion into a useless compound which may or may not be retained on or near the metal remaining”. He stated that corrosion is “a matter which has primarily concerned the engineer, but the paucity of his training in chemistry and electrochemistry has been a stumbling block to a better understanding of its mechanism”. This is a very entertaining paper to read. It sets out the electrochemical nature of corrosion, the role of anodes and cathodes, the hydrogen evolution reaction and the oxygen reduction reaction. He describes in great detail an experiment involving the corrosion of a piece of iron in a jelly containing potassium chloride, and how the visual formation of the various corrosion products of iron (with different colours) form as the ferrous irons come into contact with hydroxyl ions, then the oxidation of the ferrous ions to ferric ions and the formation of ferric hydroxide. In conclusion PFT indicated that the way to prevent corrosion was to (i) Exclude water from the metal surface, (ii) Avoid differences in potential, (iii) Avoid depolarisation of the metal by excluding oxygen, (iv) Form protective films at an anode site, and (v) Reduce hydrogen ion concentration by the addition of alkali. This advice remains correct to this day. In the 1930s, the chemical resistance of lead and its ease of fabrication made it a metal with potential for use in various process industries, in particular the manufacture of sulphuric acid. PFT therefore studied the corrosion behaviour of lead in that acid. It was known that iron as an impurity in lead would induce corrosion. He considered that the measurement of electrochemical potential with time could be a means of identifying suitable corrosion resistant lead samples. He measured the potential of three lead alloys containing 0.00026, 0.00036 and 0.0007% iron in 63% sulphuric acid solution. Unfortunately, his work showed no correlation between potential and iron content. He used a spot test to identify the presence of iron on the surface of the lead samples, but not the location of the iron, which he thought to be at grain boundaries. However this test was not quantitative. This paper is a presentation PFT gave to the Victorian Institute of Refrigeration in 1934. Even in those days as now, there was concern over the cost of corrosion. He informed the audience that “It has been estimated that 6,000,000,000 pounds is spent annually to replace the wastage by corrosion and on anti-corrosion devices”. The audience were told that the corrosion of iron is inevitable in the presence of an environment to revert to its original form of iron oxide. He introduced the audience to the concept of the formation of local anodes and cathodes on a metal surface when exposed to a corrosive environment, and how the presence or absence of oxygen at the cathode and local pH changes affect the rate of the anodic and thus the corrosion reaction. It was during this lecture that PFT first discussed the concept of passive films of oxides of atomic thickness forming on metal surfaces under specific conditions, and the ability of such films to affect the initiation of corrosion. This paper was the result of an investigation by PFT of corrosion of a crank pin in a large refrigerator. The contacting bearing surface between the pin and its journal was supposedly lubricated. The lubricating oil was meant to prevent water from coming in contact with the metal surfaces, where it could cause corrosion of the bearing surfaces. In order to prevent water access, PFT reasoned that a substance should be added to the oil which would lower the surface tension of the oil to below that of the surface tension of the water, and that such a substance should contain polar groupings. He investigated the surface tension of a number of oils with various additions of fatty acids which contained those groupings. He found that Lanolin contained certain polar groupings which gave it the power to exclude water and thus to promote a better bond between the oil and metal. He suggested that in general oils with good lubricating properties and with good water displacing properties could be designed to provide not only lubrication but also corrosion protection. Although he warned that some fatty acids may not be suitable for use in this application because of their reactivity with the gases used in the refrigeration process. Eight years later PFT gave another lecture to the Victorian Institute of Refrigeration in the Metallurgy School of the Melbourne Technical College. The content of that lecture was consequently published in Refrigeration, Cold Storage and Air Conditioning. He began by addressing the audience as follows “I am not going to deal with your troubles specifically, since you will realise that when the principles of corrosion are understood, you will have no difficulty with your own troubles”! He then proceeded with a lecture to make those principles better understood. The lecture included various examples of corrosion which included components of refrigerator compressors, nails from ancient artefacts, and a piece of stainless steel which had corroded in tap water. The last example, PFT claimed “shattered the illusion as to the impeccable nature of stainless steel”. The types of corrosion were outlined, and the thermodynamic basis of corrosion was summarised. He used elaborately hand drawn diagrams to illustrate the corrosion of a metal in the presence of oxygen, “oxygen- water type corrosion” as he termed it. He contended that the “corrosion problem had been solved during the last few years by the application of many of the ideas he had been discussing, and it remained one of the mysteries as to why chemists, presumably understanding the laws governing electrolysis ever came to regard corrosion as a problem”! During his time at the CSIR, PFT carried out many failure investigations. This one involved the failure of a component in a truck braking system. The piston in the brakes was made from an Al-Cu-Zn-Si die cast alloy. A rubber plunger in the system had failed due to degradation by the brake fluid. This had allowed water to enter the brake fluid, and had subsequently caused corrosion of the piston. The pitting and build-up of corrosion product had seized the piston and the brake failed. PFT using a combination of potential measurements and metallography showed that severe corrosion could occur in an apparent mild environment of brake fluid and water. He advised that a more corrosion resistant alloy should be considered for this application in future. Because of his work at CSIR Division of Aeronautics, PFT was interested in preventing corrosion on aircraft components. In this paper he discussed the protective nature of the oxide film that forms on aluminium alloys. He also outlined how that film could self-repair in the presence of oxygen and water through the formation of aluminium oxide/hydroxide. He showed using potential versus time curves for aluminium in a glycol water solution that in the absence of oxygen, corrosion can take place with hydrogen evolution as the accompanying cathodic reaction. He drew attention to the possibility of these conditions developing in close fitting aluminium surfaces as in joints on aircraft structures which are subject to fretting and chaffing. In a sense, this report by PFT gathered together all of his thoughts on corrosion and its prevention at the time of 1946. His aim with this report was to “put the results from his investigations into a more or less readable form for the benefit of all concerned with corrosion problems”. The report outlined how electrochemical techniques can be used to understand and solve corrosion problems, and the parameters controlling the corrosion process. In this report PFT discussed the breakdown of the protective oxide film on the corrosion of aluminium. He introduced what he termed a “Corrosion Chart” for aluminium, which summarised the areas of stability of the oxide film as a function of electrochemical potential and temperature. Charts such as this were very advanced thinking for the times. PFT concluded by stating that in relation to engineers, it was difficult for them to not to have anything but misconceptions regarding corrosion, largely because of the very little knowledge they were given in relation to the electrochemical basis of corrosion. At the time engineers were very quick to look for sources of acid to blame for corrosion when the availability of oxygen and the accompanying electrochemical reduction of oxygen to hydroxyl ions was the most active agent in the corrosion process. This was a continuation of the message he was sending to engineers back in 1932. As part of his consultancy work at CSIR, PFT was engaged by Victorian Railways to investigate the failure of condenser tubes in the then new 34 megawatt turbo generator at the Newport A Powerhouse Station in Melbourne. The condensers were multi tubular cooling devices used in steam power plants in the 1940s. As a result of this investigation, CSIR and PFT undertook a lengthy research program which produced three large reports dealing with the corrosion of copper based alloys from which condenser tubes were typically made. Part 1 of his report of this investigation covered the electrochemical characterization of the copper, zinc, brasses, Admiralty Brass, Aluminium Brass and Muntz Metal. This work looked at how the electrochemical potential of these alloys and the visible corrosion behaviour changed with time in various waters over a temperature range from 20 to 100°C. The report also investigated the effects of “impingement corrosion” as it was termed in the day, or the result of a corrosion environment and the impact of a stream of bubbles on the oxide film on these metals. In Part 2, the report outlined the results of PFT’s study on the effects of cuprous ions in the water and the effects of NaCl concentration on the corrosion of those copper based alloys. He found that cuprous ions had sufficient oxidising power to corrode brass in particular. In one of the very early studies of microbiologically influenced corrosion (MIC), PFT in Part 3 of his report investigated the effects of deposits of organic matter and the bacteria they contain on the corrosion of the copper based condenser tube alloys. The organic matter included seaweed, mussel, crab, and prawn segments generally found in the condenser tubes at the power station. This report also looked at the effects of grain boundaries in the microstructure of the alloys on susceptibility to localised corrosion, in particular how the grain boundary chemistry affected susceptibility. This work on the corrosion of copper based alloys produced an enormous volume of data and knowledge. However, because it was never published in the open literature it has never really been appreciated and referred to by the wider corrosion science community. At the time of publication of this report, “the old idea that the intrinsic tendency of a metal to ionise was materially increased by stress” was used to explain the phenomenon of stress corrosion cracking (SCC). PFT was of the belief that it was the electrochemical process taking place on the metal surface which lead to stress corrosion. He monitored the potential of aluminium specimens with time with and without increasing levels of stress. He observed negative transient excursions in the potential with increasing stress, with the frequency increasing as the fracture stress approached. The effects on these transients of aeration and deaeration in tap and salt water, and the effects of aluminium strength level were also studied. PFT postulated that the negative transients were due to rupture or breakdown of the oxide film on the specimen surface. Film regrowth was indicated by the potential curve becoming more positive. He proposed that SCC initiation was the result of dissolution of aluminium at grain boundaries where oxide and undisclosed ions concentrated, and that the applied stress opened up cavities at these locations where corrosion progressed by differential aeration. He concluded from the studies that stresses are only contributory factors in so-called ‘stress-corrosion.’ These observations proved to be important in the future mechanistic understanding of SCC. This work is another example of the forward thinking by PFT at the time. Unfortunately, this work was never cited in the open literature during discussions on SCC. Several authors since have shown the effects of stress on potential. The lack of recognition of this work is probably due to the fact that it was only ever published as an Aeronautical Research Laboratory Note. Filiform corrosion where worm like filaments of corrosion product develop beneath paint coatings had been reported by others several years earlier. This paper identified a new type of filiform corrosion, pustule, which was observed on uncoated steel specimens immersed in commercial refrigerating brine that contained chromate as a corrosion inhibitor. At first the filiform growth was observed to start from a central corrosion pustule and grow continuously from corrosion product extruded through the pustule. Growth then continued up and away from the metal surface into the surrounding solution. This paper was published after the death of P F Thompson in 1951.Dr Ken Lorking was a co-worker of PFT at ARL. This work used measurements with platinum electrodes to show that the potential of neutral sandy soils varied from +0.2 V under aerated conditions to -0.5 V under deaerated conditions. Using those potential measurements, the authors were able to deduce the depths of boundaries between aerated and deaerated soils. With similar measurements using iron electrodes and by measuring the currents between the electrodes placed at various depths, they showed that it was possible to determine the likelihood of corrosion occurring at these depths and the effectiveness of protective treatments on steel. The maximum corrosion in sandy soils, due to large-scale differential potential, was found at depths between 300 mm and 600 mm. Corrosion lessened with increasing depth, being negligible at 1500 mm. Rainfall did not affect the potentials but some increase in differential currents occurred at 300 mm and 600 mm with increased rainfall. The maximum current obtained between the electrode at 300 mm and those buried at lower levels confirmed the belief by the authors that the maximum amount of O2 for the cathodic reaction exists at 300 mm. They were of the opinion that the O2 concentration may be appreciable to a depth of 3000 mm in sandy soils, to 1200 mm in clay soils, but is not sufficient to support corrosion below 600 mm. The reason for this work was to develop an understanding of how the triethanolamine phosphate (TEAP) inhibitor used for glycol-water coolants used in aircraft radiators inhibited corrosion. There was some thought at the time that this inhibitor may actually cause corrosion. The authors measured corrosion potentials of aluminium, iron, and copper, the principal metals in coolant systems, in glycol-water solutions with and without the inhibitor using a microelectrode method described in an earlier publication. Weight loss tests were also carried out in order to determine the effects of inhibitor addition on corrosion rates. From the results the authors concluded that TEAP caused accelerated corrosion of the copper by stabilising the copper cations in solution. These cations were then able to diffuse through the glycol water mixture to aluminium and iron surfaces where copper deposited and induced corrosion of both metals. The sections above demonstrate PFT’s ability for innovative thinking, and the volume and breadth of his research indicate that he was able to apply that level of thinking to many different fields of scientific endeavour. Most importantly he was able to effectively communicate those ideas through public lectures, scientific demonstrations and publications. Thompson, like Evans, knew the persuasive impact of simple practical experiments in the corrosion field and, with the eager help of his sons and daughters, developed ways of presenting corrosion phenomena to audiences, both students and professional, (Figure 4). He had 7 children – 4 sons and 3 daughters, so he had plenty of eager help. Interestingly 3 of his children became metallurgists, another became a “process engineer” and another a “design engineer”. Magnesium alloys have been used widely in the aircraft industry mainly for gear box and generator housings, predominantly because of their low density and the weight savings. However, their use also presents an enormous problem, because magnesium alloys are very susceptible to corrosion especially in marine environments. P F Thompson was always keen to demonstrate to his students the basic principle of corrosion, and one of his favoured live experiments was to show that hydrogen evolution is an accompanying cathodic reaction to the dissolution of metals. A simple experiment is to take some magnesium alloy and immerse it into a solution of sodium chloride. Within minutes bubbles will be observed coming from the alloy. This is hydrogen gas which is being evolved at cathodic sites on the alloy surface. An experiment similar to this was a favourite of Thompson. Thompson’s love for simple practical experiments is the reason why the P F Thompson Memorial Lecture at ACA Conferences always contain experiments or demonstrations.The first P F Thompson Lecture byEd Potter in 1971, (Figure 5), included a demonstration in Thompson’s style, of the film passivity of a13% chromium steel, (Figure 6). The second name of P F Thompson is also important when it comes to electrochemistry. When his parents chose the name Faraday, were they wanting their son to be an experimentalist and corrosion scientist? More likely they were reflecting sentiments of a time when great scientific achievements of men like Michael Faraday (1791-1867), (Figures 7 and 8), still caught the imagination of the public, (Figure 9). Faraday was of course a most gifted experimentalist and is famous for a phenomenal variety of work, but it was his discovery and experimental proof of the electrochemical equivalence between current and corrosion (or “electro-chemical decomposition”) (Faraday’s Law) that made a particularly huge impact for corrosionists (Ackland, 2005). Faraday’s work enabled the calculation of how much metal will be consumed for a given electrical current and time. Faraday (1834) also defined words such as electrode, anode, cathode, electrolyte, anion and cation. As an aside, Ackland (2005) advises that it was Sir Humphry Davy (Figure 10 and 11), the founder of cathodic protection, who discovered Michael Faraday. Faraday was at one stage in his career a bookbinder’s assistant and presented Davy a fine bound copy of his notes taken during one of Davy’s lecture series. Davy first recommended that Faraday stick with bookbinding, but around that time Davy injured an eye making NCl3 and so took Faraday on as a temporary assistant. Faraday turned out to be extremely competent, was made permanent and the rest is history (Ackland, 2005). Davy postulated in January 1824 (Davy, 1824a), that it would be possible to prevent corrosion of copper sheathing on ships by connecting it to zinc, tin or iron (Ackland, 2005). This was based on his observations and conclusions from over two decades of working with galvanic couples and he certainly considered the beneficial effects for the more positive metal in the couple at least as early as 1812 (Ackland, 2005). The copper sheathing on the ships was needed to reduce fouling and prevent attack on the timber by worms. Davy then reported on full-scale trials in June 1824 (Davy, 1824b) and showed the complete effectiveness of zinc and iron in protecting the copper (Ackland, 2005). He also published in June 1825 (Davy, 1825) the influence of ship movements on the efficiency of the protection action and the effects on fouling (Ackland, 2005). Percival Faraday Thompson, (1885-1951), a metallurgist and chemical analyst, is generally considered a corrosion research pioneer in Australia. The P F Thompson Memorial Lecture at the annual ACA Conference celebrates P F Thompson. This paper attempts to provide some of the history of PFT, his career and the breadth of his research achievements. It is clear that the man was much ahead of his time, in terms of his innovative thinking in the areas of analytical chemistry, mineral processing and assaying, and his ability to convey with such clarity his ideas through many lectures and publications. Potter (1972) who delivered the first PFT Lecture in 1971 notes that “yet in separate perverse ways, both international acclaim and conscious retirement eluded PFT, and he enjoyed no more than a languid waning of technical toil”. Ackland, B (2005), Cathodic protection – black box technology?, Proc. Corrosion & Prevention 2005 Conf., Australasian Corrosion Association Inc., Gold Coast, November, Paper 004. Davy, H (1824a), On the corrosion of copper sheeting by sea water, and on the methods of preventing this effect; and on their application to ships of war and other ships, Philosophical Transactions, 114, 151-158. Davy, H (1824b), Additional experiments and observations on the application of electrical combinations to the preservation of the copper sheathing of ships, and to other purposes, Philosophical Transactions, 114, 242-246. Davy, H (1825), Further researches on the preservation of metals by electro-chemical means, Philosophical Transactions, 115, 328-346. Faraday, M (1834), Experimental researches in electricity, seventh series, Philosophical Transactions, 124, 77-122. McCarthy, G (2001), Technology in Australia 1788-1988, Australian Academy of Technological Sciences and Engineering, Melbourne, 706. See http://www.austehc.unimelb.edu.au/tia/about.html. Potter, E G (1972), The corrosion scene in Australia, Australasian Corrosion Engineering, March, 21-29. Thompson, P F (1922), Volumetric determination of iron – A new method of reduction, Proc Australasian Inst. Mining Metallurgy, No. 47, 343-346. Thompson, P F (1926), Sodium thiosulfate in volumetric analysis, Chem. Eng. Mining Rev. 1926, Vol. 18, 460-4611. Thompson, P F (1929), The rapid determination of lead, Proc. Soc. Chem. Ind. Victoria, 1926, Vol. 29, 154-159. Thompson, P F (1930), Sense of proportion in analytical chemistry, Proc. Soc. Chem. Ind. Victoria, 1930, 335-342. Thompson, P F (1931a), Three indicators, Proc. Soc. Chem. Ind. Victoria, 1931, Vol. 31, 536-44. Thompson, P F (1931b), Refractories and their uses, Chem. Eng. Min. Rev. 1931, Vol. 23, 455-459. Thompson, P F (1932a), The case against standardisation of chemical analysis, Chem. Eng. Mining Rev. 1932, 31-32. Thompson, P F (1932b), The use of potassium hydroxide as a fusion reagent, Proc. Soc. Chem. Ind. Victoria, 1932, Vol. 32, 699-704. Thompson, P F (1932c), A high temperature experimental furnace, Proc. Soc. Chem. Ind. Victoria, 1932, Vol. 32, 693-699. Thompson, P F (1932d), The corrosion of metals, Proc. Australasian Inst. Min. and Metall. 1932, No. 87, 175-191. Thompson, P F (1932e), Corrosion of chemical lead, Proc. Australasian Inst. Min. and Metall. 1932, No. 87, 193-206. Thompson, P F (1933a), Organic indicator for dichromate titrations, Proc. Soc. Chem. Ind. Victoria, 1933, Vol. 33, 810-811. Thompson, P F (1933b), The solubility of tellurides in cyanide solution, Chem. Eng. Mining Rev. 1933, Vol. 26, 90. Thompson, P F (1934a), The development of analytical chemistry, Chem. Eng. Mining Rev. 1934, Vol. 26,. 213-217. Thompson, P F (1934b), Application of science to mining and metallurgy in Australia, Proc. 5th Pacific Science Congress, 1934, Vol. 1, 623-624. Thompson, P F (1934c), Corrosion of metals. Effects of electrolysis and oxidation, Ice Cold Storage, 1934, Vol. 37, No. 436, pp. 118-119. Thompson, P F (1935), Lubrication and corrosion, Jnl. Proc. Aust. Chem. Inst. 1935, Vol. 2, 50-54. Thompson, P F (1943), Corrosion of metals. Refrigeration, Cold Storage and Air-Conditioning. 1943, Vol. 14, 17-22. Thompson, P F (1945), Failure of a Hydraulic Brake System Due to Corrosion, Australian Council for Aeronautics Report No. SM 144, Division of Aeronautics. Thompson, P F (1946a), Some aspects of the corrosion of aluminum, J. Council for Scientific and Industrial Research (Aust), Vol. 19-20, 157-165. Thompson, P F (1946b), Corrosion of metals. Metals in aircraft engine cooling systems, Australian Council for Aeronautics Report No. ACA-24, Published by the Council for Scientific and Industrial Research (Aust). Thompson, P F (1947), The dissolution of gold in cyanide solutions, Trans. Electrochemical. Soc., Vol. 91, 41-71. Thompson, P F (1950), Corrosion of condenser tubes, Australian Council for Aeronautics Report No. SM 113, Parts 1, 2, and 3, Division of Aeronautics. Thompson, P F (1950), Corrosion of metals under stress: Aluminum, Aeronautical Research Laboratory Report No. SM 143, Aust. Dept. of Supply and Development. Thompson, P F and Lorking, K F (1955), Filiform corrosion products on iron immersed in brine, Corrosion (NACE Houston, TX, US), Vol. 11, 309t-311t. Lorking, K F and Thompson, P F (1956a), Methods for assessing the corrosion of iron in soils. Preliminary experiments, Aeronautical Research Laboratory Report No. Met 15, Aust. Dept. of Supply Research and Development Branch. Thompson, P F and Lorking, K F (1956b), Some Aspects of the corrosion of iron, copper, and aluminum in ethylene glycol coolant fluids, Corrosion (NACE Houston, TX, US), Vol.13, 531t-535t.